Painting steep pitched roofs is extremely challenging..
Pressure cleaning and painting steep roofs requires a great deal of skill and height safety knowledge. Recently, the prestigious Maleny Manor on The Sunshine Coast decided it was time for a roof restoration. Alltech was only too happy to help. When working on high roofs, you should always be attached to a solid lifeline… It’s the only thing that stands between you and a very close encounter with the pavement! unless you’re a highly trained rope access technician like those we employ here at Alltech of course! Needless to say, when a painting company approached us to ask if we were able to pressure clean and repaint this impossibly steep roof on Maleny Manor in the Sunshine Coast hinterland, we jumped at the opportunity to test our skills. you need to know what type of Height Safety System you’re going to use. How high is the roof? Is it made out of concrete, spandek, clip-lock, corrugated iron or something different? If it is a tin roof, what is supporting it underneath? Is it steel purlins or wooden trusses? How am I going to be sure that the roof integrity is maintained and no leaks occur around the anchors? Will the anchor be under a constant load or are they just there in case of a fall? What type of harness and fall arresting device will be used with the system? After taking all this into consideration we decided to go for the PEHQ surface mounted anchor points for this project, which are self sealing and capable of sustaining loads up to 750kg. We then installed a column of anchors, starting at the bottom – so you can hook on before getting off your ladder – all the way to the top, and then every couple of metres across the apex of the roof allowing the worker to be safely attached at ALL TIMES. Once you have the right height safety system in place, you need a contractor who has the skills not only to paint and pressure clean, but the knowledge utilise the system to prevent falls from occurring. 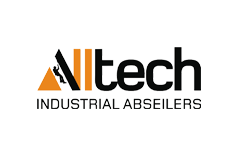 Alltech Industrial Abseilers employs trained rope access technicians and work at height contractors with a broad range of expertise from painting, pressure cleaning and window washing to concrete repair, sign installation and more. For this job we used Matthew, who is one of our highly skilled painters and decorators with extensive qualifications and training that allows him to carry out his job in any work-at-height environment. Despite the height and pitch of the roof he was able to pressure clean, spray one undercoat and 2 top coats of paint on this 500 sqm roof at Maleny Manor! Whether you want a roof restoration or you’re tradesman who just needs a height safety system to carry out your own work, contact us now on 0423 406 099 to find out how we can make your job easier.